Pep Guardiola is refusing to talk up his team’s title credentials despite three successive league wins taking Manchester City to within eight points of leaders Chelsea. A 2-0 win at Bournemouth on Monday saw City leapfrog three sides and climb into second place after a goal in each half was enough to see off the challenge of Bournemouth at The Vitality Stadium. But Guardiola conceded he can’t imagine Chelsea letting such a commanding lead slip in the remaining thirteen games of the season. “It’s so difficult because they have to lose three games and you have to win all the games and you know how difficult it is to win all the games in the Premier League,” said Guardiola. “Now before the game we were sixth and after the game we are second. This was an accomplished away performance from City who were slick in possession and lethal on the counter. 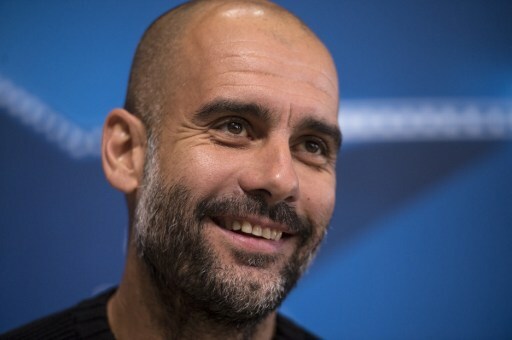 “I am so so happy for the result,” said Guardiola. Raheem Sterling had struck the post three minutes before he opened the scoring with the assist for his goal coming from the outstanding Leroy Sane. “Since the game against Arsenal, I think he (Sane) made a click. He’s so fast, his intensity helped us a lot and 20 years old so, I’m so happy for Manchester City because we will have a good player for many years,” said Guardiola of the former Schalke forward. This victory came at the cost of an injury to prodigious Brazilian striker Gabriel Jesus who, up until withdrawing with a foot injury after 14 minutes, had been keeping Sergio Aguero out of the starting eleven since his arrival in Manchester. Aguero made the impact Guardiola would have hoped for. City’s second came when Sterling bamboozled Adam Smith with a series of step-overs and crossed for Aguero who poked the ball in via Tyrone Mings’ toe. “I’m happy for him (Aguero). For how he played, for how he fights,” said Guardiola. Eddie Howe can be pleased with the way his side applied themselves but, with no wins so far in 2017, it is points Bournemouth need, not performances — they are without a win this year and only six points above the relegation places. “I can’t ask anymore of the players in terms of how they conducted themselves tonight,” said Howe. “I just thought they were better. Howe too was blighted by injuries and forced into two changes when first Simon Francis and then Jack Wilshere left the field with hamstring and ankle injuries respectively.